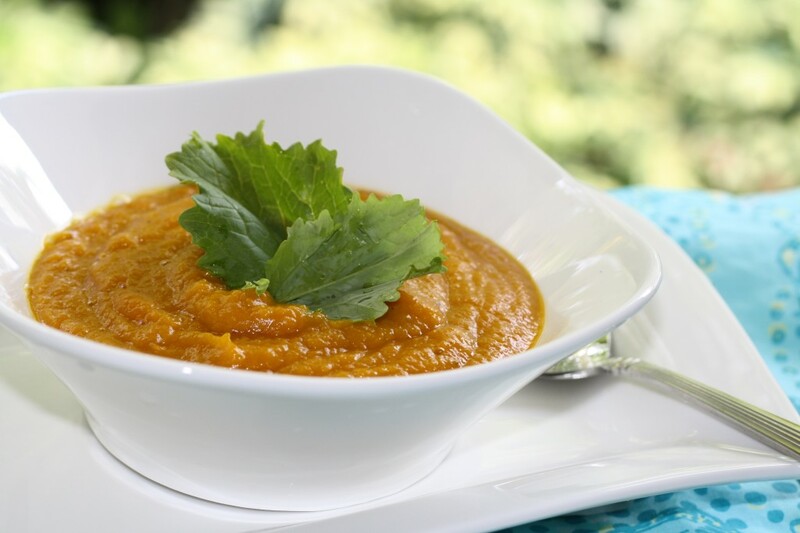 Fragrant, creamy and perfect on a cold winter’s day, this interesting twist on butternut squash soup is Recipe is Gluten-Free, Dairy-Free, and Vegetarian! Place butternut squash on a baking sheet, skin sides down. Rub the flesh with extra virgin olive oil and season with salt to taste. Roast butternut squash for about 35-40 minutes, or until flesh is fork-tender. Remove from oven and set aside to cool. When cool enough to handle, scoop out the pulp from the butternut squash and set aside. Heat 1 tablespoon extra virgin olive oil in a large heavy saucepan over medium-high heat; add the ginger and sauté 30 seconds. Add the onion and celery and sauté 4-5 minutes, or until vegetables are soft. Add the roasted butternut squash pulp and Thai Kitchen Red Curry Paste and stir to combine. Add the vegetable broth, coconut milk and lime juice. Use a handheld stick blender to process until smooth and creamy. Simmer for 10 -12 minutes. Serve warm.